My BubbleDisplay project needed to control sixty DC motors or solenoids to control air injection into individual columns of liquid. 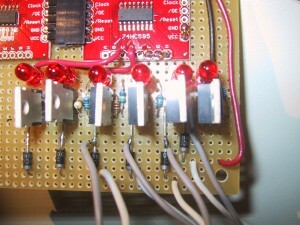 Due to the large number of outputs needed, I am using a chain of (74HC595) serial shift registers so that three I/O pins can control all sixty outputs. 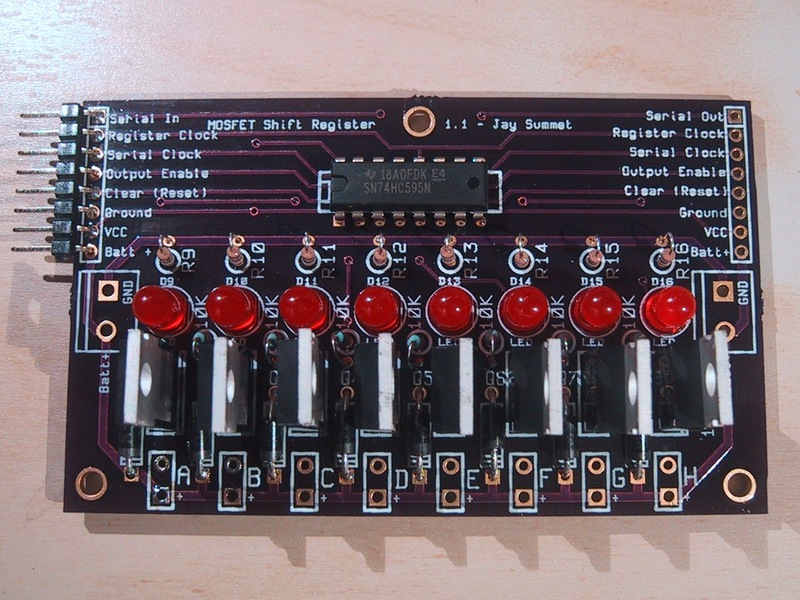 As each serial shift register has 8 outputs, this requires eight chips (for a total of 64 outputs, four are unused). The 74HC595 can not source/sync enough current to drive the motors/solenoids directly, so I am using a TO-220 N-Channel MOSFET rated at 60 volts and 32 amps (digikey: FQP30N06L-ND) to drive the load, with an 1N4001 rectifier diode to handle current spikes. Because I had to make 8 (9 for a hot spare) copies of this circuit, I decided that fabricating a printed circuit board was the only way to go. It only took me two tries (Moving from Version 1.0 to 1.1) before I was happy with the design, which you can see (populated for testing) above. Looks a lot nicer than the prototype, right? I used the open source KiCad EDA software suite for the schematic capture and board layout and was quite happy with it. (Be sure to go through the Tutorial if you are just getting started!). The right angle (R/A) headers allow you to daisy chain boards next to one another, but you could omit them and connect the boards using hook-up wire (not recommended for a large number of boards…) You may note that with the exception of the extra BATT + connection (allowing the MOSFETS to switch a voltage higher than logic level to the outputs) the connections are in the exact same order as SparkFun’s 74HC595 breakout boards so you can daisy chain them together. Although the 8 pin header has a BATT+ connection, if you are switching large currents you should also connect up the extra large GROUND and BATT+ pads with larger gauge wire. You could also NOT daisy chain the BAT+ connection and drive each board or set of boards from its own supply. 22 of 60 tubes running – First scaling up problem rears it’s ugly head. 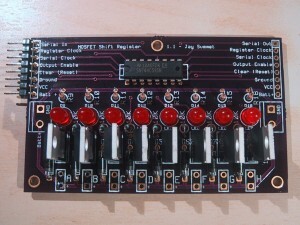 This entry was posted in Projects, Technology and tagged bubbledisplay, shiftmosfet by Jay. Bookmark the permalink. How much current do you think the PCB can handle? I need something like this to drive 12V LED strips. Congratulations the project you did. This project will be my first arduino project . I carefully investigated your videos and your blog. I will make Serial Shift Register MOSFET driver (version 1.1) PCB s but and I could not find the arduino uno sketch and circuit diagram for connections. I will also use 60 air pump. I will be gratefull if you share with me. Thanks. At last finished the project and the only thing we need is shifter library. Can you share with us because we could not find it. Thanks. Although many other people have built similar libraries and explanations of how to build your own. I have the source code but i dont know the arduino uno s which legs will be connected to which curcuit inputs you designed (Serial Shift Register MOSFET driver (version 1.1)) .Thanks. I’m afraid that I do not have a circuit diagram for this project. It is a relatively involved project, and I would not advise it as your very first project. That being said the circuit wiring is relatively simple. The source code specifies which pins go out to the RGB led’s and which pins go out to the serial shift MOSFET’s. Of course, you will also need to provide the appropriate (12v for the motors and 5v for the LEDs) external power to each device. I would recommend that you work with a single shift register (use the LED’s on it to get used to programming it before connecting any real motors) and a single strand of RGB LED’s to make sure you have all the signal wires connected correctly before trying to add more power/motors/leds. I think I will start with one single shift register.Thank you for your advise and quick reply. Hi. I am trying to open your schematic in Kicad (shiftMosfet.sch) but it complain about 2 missing libraries. Any chance you could provide links to the dependencies lib ? or maybe thoses libs aren’t really used by your schematic. 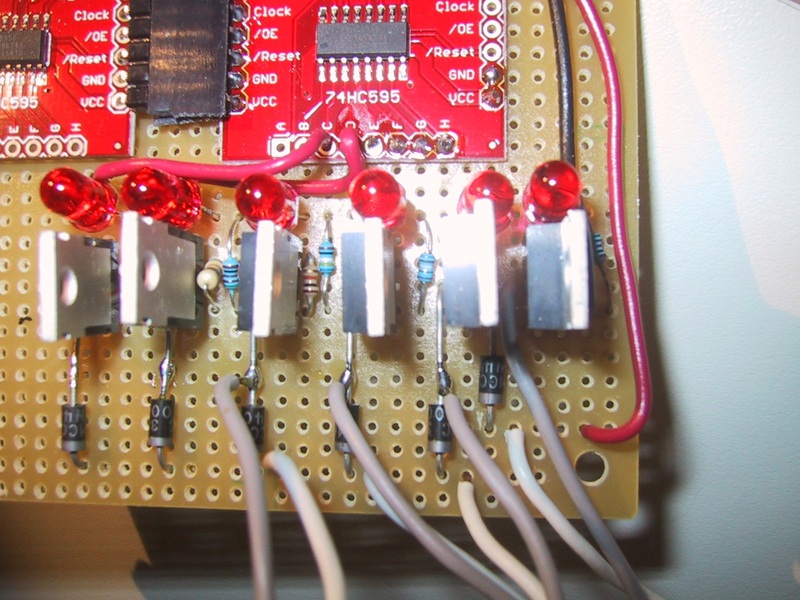 Yes, you can PWM the outputs, but the PWM frequency is (much) slower than with a dedicated pin. And every time you add more outputs to your serial line, the speed at which you can PWM them goes down. I wasn’t having any problems turning individual pins on or off with 1-2ms accuracy, so PWM up to 500 Hz would be possible (if my Arduino did nothing else). Instead of using PWM to control the motors, I just turned the “weak” ones ones on a few MS earlier than the “strong” motors to get all the bubbles to be the same size. could you tell me a way i could get round this problem please…. Hello, do you have these boards for sale? I need 12 units ready to play. I’m afraid I don’t sell them, but you are welcome to use the files provided to have the PCB’s manufactured and build some yourself. Jay – really appreciate you putting this out there. I’m trying to control a system to scare away turkeys at our organic farm, and this is much better than my board. Question for you though – what’s with the 4mm spacing on the final output connections? Did you have a connector in mind for that? If you mean the high current output that drives the motors, those are designed to have through hole wires soldered directly to the board, you may need to change the spacing for connectors.